New England Aquarium officials are investigating after the 27-foot long minke whale was found dead Sunday morning near Marshfield’s Brant Rock. The 27-foot long adult female minke whale was found dead Sunday morning in shallow water near Marshfield's Brant Rock. Minke whales are the smallest of the large whale species found in New England waters and are often seen on whale watches in the region. Minke whales have been dying in unusually high numbers along the U.S. East Coast, from Maine to the Carolinas. 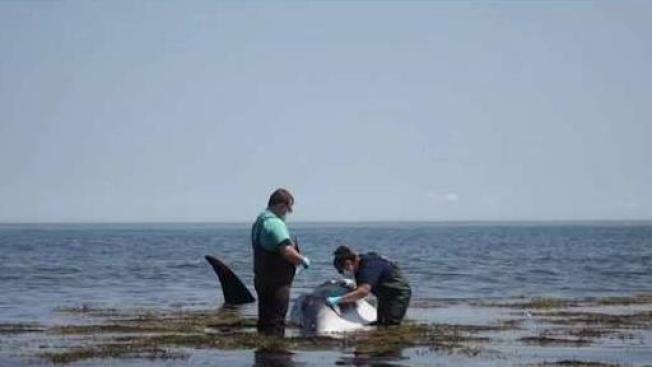 New England Aquarium officials are investigating the death of a whale that was found on the South Shore of Massachusetts. The 27-foot long minke whale was found dead Sunday morning near Marshfield’s Brant Rock. The aquarium’s animal rescue team responded, and two biologists waded into the water from knee to waist deep to do an initial exam and take tissue samples. The whale’s carcass is pinned against a rock jetty on its side in shallow water. Aquarium officials say the adult female whale was thin but not emaciated. There was no visible gear from a possible entanglement, and there was no major trauma visible from a possible vessel strike. The whale, however, did have significant cuts and deep, long scratches on its underside and tail stock. Officials say these injuries were a result of the whale thrashing about in shallow water when first seen on Saturday evening. Thick fog at Brant Rock enveloped the minke late Saturday night and remained until about 10 a.m. Sunday when the carcass was found, leading officials to say the whale died overnight. Authorities say the minke whale was already near death when it was first seen Saturday night, exhibiting a swimming pattern and other behaviors that are characteristic of whales that are in great health distress. Aquarium biologists cannot perform a more complete necropsy with the whale in its current location, pinned against a jetty in shallow water at low tide and along the very rocky, narrow shore. They plan to consult with Marshfield and federal officials to see what might be feasible given its location and resources. They are a protected species like all whales in U.S. waters, but their population is not considered either endangered or threatened. Since January 2017, however, minke whales have been dying in unusually high numbers along the U.S. East Coast from Maine to the Carolinas. Aquarium officials say this is believed to be the 38th dead minke whale that has been documented. The National Oceanic and Atmospheric Administration, the American federal oceans agency, has declared an “unusual mortality event” and is committing additional resources to try to learn what might be affecting the species.